and a list of "missing" classmates the reunion committee has been unable to find. A total of 222 Classmates, Spouses/Guests intend to attend the 50th Reunion so far. The Santa Cruz High School web site has finally added an alumni page and the SCHS Alumni Assn. now has its own email address! Scroll down this page to the item headlined, "Join The SCHS Alumni Association." Final plans for the three-day 50th Reunion of the Santa Cruz High Class of 1954, scheduled Sept. 10-11-12 (Friday, Saturday and Sunday), 2004, have been announced by John Biondi of Santa Cruz, reunion committee chairman. "The times for all days have been finalized," Biondi said. "Invitations to the reunion will be sent by postal mail the first week of June to all classmates whose addresses are current and are on file with the alumni office." o Dedication of the Tommy Stears Memorial Bench at 10 a.m. in front of the Miramar Restaurant on the Santa Cruz Wharf. o Informal get-reacquainted party at Harvey West Park Clubhouse, 4-6 p.m.
o Tour of SCHS campus, starting at 11 a.m. on the Senior Steps. o Group photos will follow on the Senior Steps. o Dinner-dance in Bay View Room, Cocoanut Grove, Santa Cruz Boardwalk, 6 to 10 p.m. Cost is $50 per person due before Aug. 1. After that date, the price is $60 per person. Since January 2000, the '54 Cardinals have been getting together monthly, alternating between lunch and dinner. As of May 2004, 103 different classmates have attended one or more of our informal affairs. The get-togethers are held on the last Wednesday of the month, except when there is a conflict with a holiday, this year in November and December. Dinners are held at the Hindquarter, lunches at Chaminade. We start gathering at 6:30 p.m. for the dinners and 11:30 a.m. for the lunches. The alumni office is open Monday and Wednesday, from 1:15 to 4:15 p.m.
Dues are 3 dollars a year, or 35 dollars for a lifetime membership. The association postal-mails a newsletter twice yearly to all members. The Class of '54 has another web site at MyFamily.com -- a private one where we post personal information and photos. All members of the SCHS Class of '54, whether graduates or not, are invited to participate. There is no charge or obligation, but a password is required. About 135 members of the Class of '54 participate, and there are a few members from other classes. Remember those cool Fifties' nights cruisin' the drag between Spivey's Five-Spot Drive-In on the East Side and the Cross Roads Drive-In on the West Side. . .
o Rendezvousing at the drive-ins to show off our wheels . . .
o Wolfing down the "4th meals" of hamburgers, french fries and milk shakes served by a carhop . . .
o And, before any evening ended, talking our dates into driving out on West Cliff Drive to watch the mythical submarine races in Monterey Bay? The Five-Spot, which previously was called Bosley's Drive-In, is long gone, replaced by a two-story office building. At the other end of Santa Cruz County, Carroll's Drive-In in the City of Watsonville has vanished as if it never existed. But the Cross Roads, the drive-in that became a teen hangout from 1947 to 1960, when it became Danny's Drive-In, still stands. After Danny's folded in the mid-1960s, the unique, octagonally-shaped building housed a liquor store until March 2002, when it was temporarily turned into a flower shop for the Santa Cruz Homeless Garden Project. 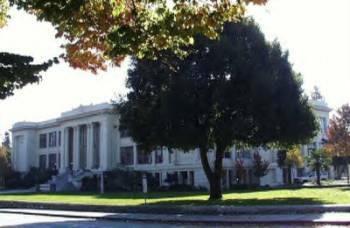 The building's days are numbered, however, because the City of Santa Cruz, which now owns the property, eventually plans to raze it and erect a natural history museum in its place -- instead of incorporating the building as part of the museum development. But many 1950s' grads, led by the Class of '54, want the building preserved and have written to City Hall and the Santa Cruz Sentinel newspaper to ask that the Cross Roads be spared from the wrecking ball and be made part of the museum complex. To learn more about efforts to Save the Cross Roads, including excerpts from letters written by 1950s' students now living throughout the U.S., photos and news articles, click on the link at the right. 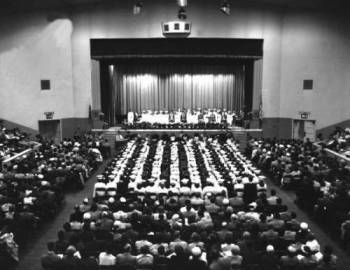 June 12, 1954, in the Santa Cruz Civic Auditorium. older brother of Jun Lee, a member of the Class of '54.